From frozen bake in a pre-heated 350ºF convection oven for 8-10 minutes or until internal temperature reaches 165ºF as measured by use of a thermometer. A smaller version of Kabobs iconic Mini Beef Wellington. 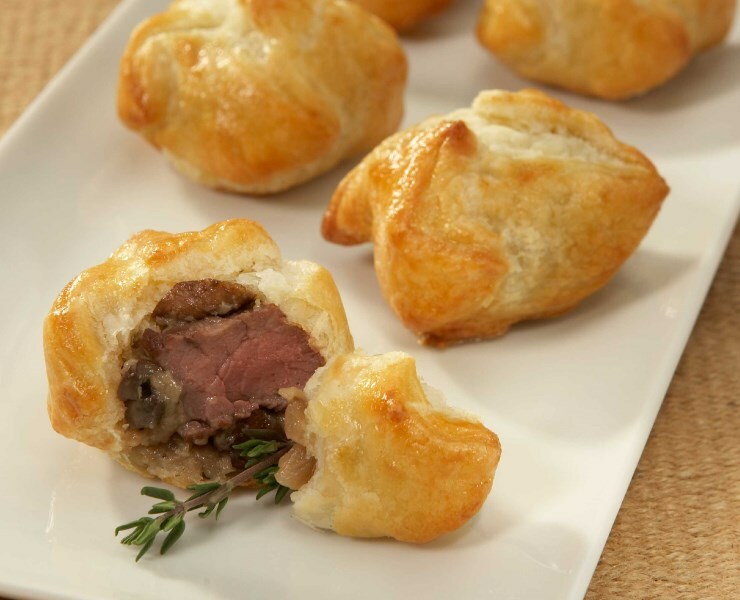 Our culinary team utilizes fresh hand-cut USDA Choice beef tenderloin, accompanied by a savory mushroom duxelle, then folded in a French-inspired puff pastry to create this upscale hors d’oeuvre. Perfect plain, or resting on top of a drizzle of balsamic vinegar reduction with cinnamon. Kabobs Petite Beef Wellington provides your dining patrons with a true ‘one-bite’ experience. Roasted cauliflower, butternut squash, red onion, edamame, red bell pepper, and zucchini, accented with crushed sea salt and placed on top an herb polenta cake. Crisp vegetables mixed with Oriental seasoned duck combined with classic Hoisin sauce wrapped in a delicate spring roll wrapper. Onions, potatoes, and peas, mixed with a fragrant medley of herbs and spices, wrapped in a chick-pea blended flour triangle pastry. A juicy chicken tender dipped in a pecan batter and rolled in toasted pecan pieces and bread crumbs.